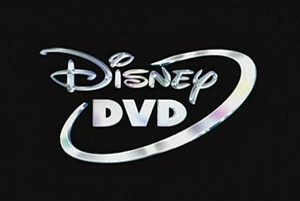 Many DVD lovers likes hot DVD movies released by Disney, Warner, Lamont, and 20th Century Fox etc. 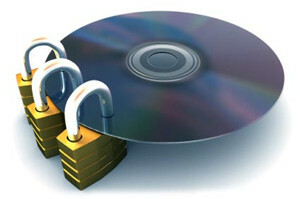 with DVD encryption and often copy protected DVDs onto the computer for further preservation. But it's hard to unlock copy protection from DVDs. Therefore, program crashed, video and audio out of sync and wrong title selected are of common occurrence during the process. Why these happened? Is there an easy-to-use Mac DVD ripper can backup protected DVDs successfully? Check the guide on how to copy DVDs with restrictions below. Wanna copy DVDs with content protections like Region Code, CSS, UOP, REC, APS, Sony ARccOS and Disney DRM etc smoothly without errors like any crashes, being stuck, video and audio out of sync etc to popular formats and mobile devices, you may need a professional DVD decrypter for Mac (Mojave) or Windows (10) like MacX DVD Ripper Pro. Easily copy and rip any latest commercial copyrighted DVDs fast with riginal quality reserved. 1Add DVD. Free download this DVD decrypter for Mac and launch it on your computer. For PC users, free download the Windows version. Load your DVD disc or DVD ISO file or DVD folder by clicking the icon on the upper area. 2Choose the output formats. After loading the disc, choose "DVD Backup" at the Output Profile area. Here we offer you four modes to meet your various demands of copying DVD to DVD. 3Specify output file path. Then, click "Browse" button to select the output destination folder where can store your copied DVD file. 4Start DVD copy. Finally, hit the "RUN" button to start to decrypt and copy protected DVD to DVD, MP4, AVI, MOV, ETC. just in minutes. By the way, you could see the ripping process and remaining time on the pop-up window and cancel it in anytime. With this professional protected DVD backup software, copying protected DVD can be rather handy and fast. Actually, a 2-hour DVD movie can be copied on Mac computer within less than 30 minutes. In other words, you can easily copy new DVD releases like Captain America: Civil War, Zootopia, The Hunger Games: Mockingjay, Part 2 , Deadpool etc. within half an hour. Another striking point of the tool is the output of the DVD copied is almost the same as the original DVD. Therefore, you could watch your beloved DVD with your familiar DVD Player or iPhone iPad etc. and keep the DVD you purchased in safe from scratch or damage at the same time. Tips: Here's how to transfer protected DVD to iPhone iPad without iTunes - turn to easy-to-use yet fast file transfer, MacX MediaTrans, and move the copied DVD files by simply clicking "Adding". Movies formatted with MKV FLV MTS etc. can be imported smoothly without format issues thanks to the iTunes alternative mac built-in video converter. In addtion, it can mount iPhone as hard disk drive, also iPad iPod, to store data, not limited to DVD movies. As we know, almost all commercial DVDs are copyrighted in case of pirate and improper commercial use. Thus when people want to copy encrypted DVD for personal storage and watching, it becomes a big issue to unlock protection measures from DVD such as Region, CSS, UOP, REC, APS, Sony ARccOS and Disney X-project protection. Before we learn the guide on how to break protection schemes on DVD, let's learn these common copyright restrictions. * Disney New DVD Copy Protection: Many users are asking why their rippers crashes when they want to rip Disney movies like Jungle Book, Inside Out etc. This is because the copy restriction named Disney X-project protection imposed on Disney movies prevent regular copyright disc protection software or free DVD ripper for Mac/PC to detect the right title. Common rippers have trouble to backup protected DVD with Disney X-project protection for that it has 99 titles which disabled most ripping software including Handbrake and comes with up to 50GB. * Content Scramble System (CSS) Encryption: The Content Scrambling System (CSS) is a DRM encryption system that encrypts data on commercially DVDs to prevent software from backing up copyrighted DVDs. It uses a decryption algorithm that mixes the key information exchanged between the disc and hardware device to produce a unique key. So many Windows or DVD decrypter Mac can't find the key to successfully unlock content protection from DVD. * DVD Region Code: Many users will even have trouble playing foreign DVDs on DVD player for different DVD region code. Region code is a kind of DVD copy encryptions that is imposed on all commercial DVDs, which allows DVD to be played on DVD players having the same region code. So users need to remove the region code to rip protected DVDs with region code. Q1: my DVD is resistant to the standard rippers. DVD Shrink doesn't see the movie, just the menus. SmartRipper starts to rip, than hangs with an error. DVD Decrypter starts to rip as well, but runs into a bunch of read errors. How to rip DVD on Mac without errors? Q2: I use my DVD ripper to rip Toy Story special edition DVD with no luck. It stalls and then stops responding. Many many 1.2 GB titles, all with different numbers like title11_1,2,3,4,5, title 8_1,2,3,4,5, etc. Q3: The ripper goes well until a message comes up saying that The DVD is copy protected and stop responding. Well, like we have said, normal decrypters can't rip protected DVD with strong restriction. Take Disney X-project protection as an example, Disney protection is extremely hard to decrypt for there is only one correct title in 99 likelihood of confusion and it updates constantly. Ordinary applications like Handbrake are often incapable or fail to copy encrypted DVD, or you'll need a third-party DVD ripper such as Libdvdcss for Handbrake to rip copyrighted DVD. It can be rather annoying to install two different software. Maybe you need an all-around Mac DVD ripper for copyrighted DVD. MacX DVD Ripper Pro is a good choice for you indeed. This tutorial teaches you to convert ISO to MP4 on Mac OS (Mojave) for playback on iPhone, iPad, Android, etc. with a professional yet easy-to-use ISO to MP4 compressor converter for Mac. 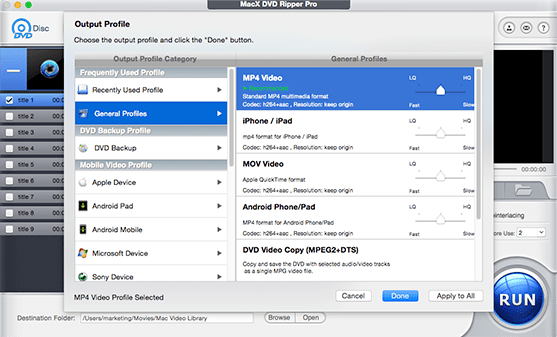 MacX DVD Ripper Pro can rip CSS protected DVD to Hard Drive as MP4, WMV, FLV, MOV, MPEG, MP3, etc., or rip protected DVD to portable devices, such as iPhone XR/XS/X/8/7/6S/6/5S/5C/5, iPad 4/Mini, iPod, Apple TV, Android, PSP, PS3 and more. MacX DVD Ripper Pro is No.1 fast DVD copy software which can decrypt and bypass any DVD protection and rip/convert any new copy-protected DVDs to various video formats (MP4, MOV, MKV, AVI, FLV, etc) and portable devices with original quality.